Adm. Michael Rogers, chief of the U.S. Cyber Command and director of the National Security Agency, testifies before the Senate Armed Services Committee on Tuesday. Sen. Jack Reed of Rhode Island, the committee's ranking Democrat, asked Rogers, "Have you been directed to do so, given this strategic threat that faces the United States and the significant consequences you recognize already?" "No, I have not," Rogers replied. But the spy chief pushed back on suggestions that he should seek a presidential signoff. "I am not going to tell the president what he should or should not do," Rogers said when Connecticut Democrat Richard Blumenthal pressed him on whether Trump should approve that authority. "I'm an operational commander, not a policymaker," he added. "That's the challenge for me as a military commander." Rogers agreed with Blumenthal's estimation that Russian cyber operatives continue to attack the U.S. with impunity and that Washington's response has fallen short. "It hasn't changed the calculus, is my sense," the spy chief told Blumenthal. "It certainly hasn't generated the change in behavior that I think we all know we need." The only intelligence agency head to be held over from the Obama administration told Massachusetts Democrat Elizabeth Warren that he believed Russian President Vladimir Putin has reached a conclusion: There is little price to pay for his actions and they can therefore continue. Rogers wasn't finished. "Everything, both as the director of the NSA and what I see on the Cyber Command side, leads me to believe that if we don't change the dynamic here, this is going to continue and 2016 won't be viewed as something isolated," he added. "This is something that will be sustained over time." In another part of an oversight hearing in which Rogers appeared as the sole witness and in which Republican members kept silent about the Trump administration's response to Russian meddling, Reed asked whether Moscow was trying to obtain a strategic objective by influencing U.S. public opinion on elections. "Yes, sir," Rogers replied. "I believe they're attempting to undermine our institutions." Without going into details, he said he has directed the Cyber Command's Cyber Mission Force "to begin some specific work" in response to Russia's interference in U.S. elections. But Rogers also made clear that he had not been granted what he called "the day-to-day authority" to disrupt Russian hacking operations at their point of origin. That, he said, would have to come from Trump through Defense Secretary Jim Mattis. "Nobody is denying him the authority," White House spokeswoman Sarah Huckabee Sanders said when asked about Rogers' testimony. "We're going to continue looking at different ways to combat [Russian meddling], and I would imagine that that will be certainly a big part of it, but I can't speak to anything further on it right now." Even if he were granted authority to act, Rogers questioned during the Senate hearing whether his agencies' capabilities would be the best or only response to those attacks. "Be mindful of falling in the trap that just because someone comes at us in cyber that we have to default to immediately going back and doing the exact same thing," he warned. "I've always believed we need to step back and think a little bit more broadly about it and just don't default — it's because of that, you know, that I have not done that to date." Rogers pointed to U.S. economic sanctions against Russia and Justice Department special counsel Robert Mueller's indictment last week of 13 Russians (which Rogers acknowledged not having read) as measures that have put a price on Russia's troublemaking. "I think, in fairness, you can't say nothing's been done," he said. "But the point would be, it hasn't been enough." This was likely Rogers' last appearance before the panel before his retirement this spring. Trump has nominated Army Lt. Gen. Paul Nakasone, head of the U.S. Army Cyber Command, to replace Rogers. The appointment requires Senate confirmation. If it's anyone's job to go after Russia for meddling in U.S. elections, it would probably be the job of Admiral Mike Rogers. He's director of the National Security Agency and of the U.S. Cyber Command. But Rogers is telling Congress it's not that simple. He says President Trump has not given him the green light to target Russia's online sabotage at its source. Here's NPR's David Welna. 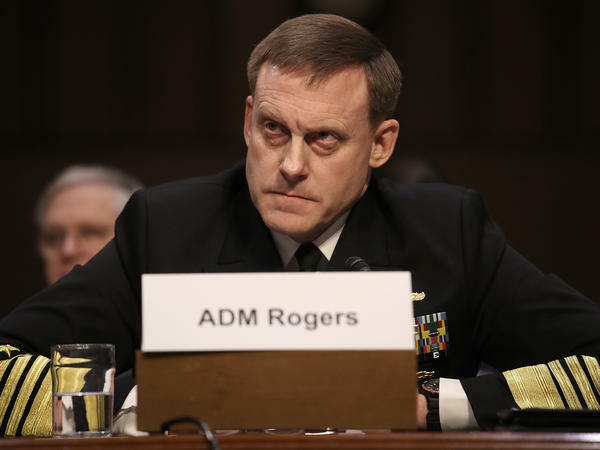 DAVID WELNA, BYLINE: It was likely Admiral Rogers's last appearance before the Senate Armed Services Committee, since he'll soon be retiring. Jack Reed, the panel's top Democrat, seized the occasion to push Rogers on just how much leeway he's being given to disrupt Russian election-hacking operations at the point where they originate. MIKE ROGERS: If granted the authority - and, I don't have the day-to-day authority to do that - if granted the authority. JACK REED: So you would need basically to be directed by the president through the secretary of defense. REED: Have you been directed to do so given the strategic threat that faces the United States and the significant consequences you recognize already? ROGERS: No, I have not. WELNA: At the White House, spokeswoman Sarah Sanders pushed back when asked why Rogers had not been given such authority. SARAH HUCKABEE SANDERS: Nobody is denying him the authority. We're looking at a number of different ways that we can put pressure. Look, this president, as I told you last week, has been much tougher on Russia than his predecessor. WELNA: But under questioning from Connecticut Democrat Richard Blumenthal, Rogers did not portray Russia as buckling under any pressure from the White House. ROGERS: Yes, sir. I think that's true. BLUMENTHAL: They're doing it with impunity. They could care less what we think. They're continuing to attack us. WELNA: None of the Republicans on the panel had questions for Rogers about Russia's election meddling, but other Democrats did. Massachusetts' Elizabeth Warren wanted Rogers to tell her what message Russian President Vladimir Putin got from Trump's refusal to enforce sanctions against Russia for its cyber-intrusions. ROGERS: I believe that President Putin has clearly come to the conclusion there's little price to play here. ROGERS: And that therefore I can continue this activity. WELNA: And Rogers also had a warning for the Senate panel - this is not going to end anytime soon. ROGERS: Everything, both as a director of NSA and what I see on the Cyber Command side, leads me to believe that if we don't change the dynamic here, this is going to continue, and 2016 won't be viewed as something isolated. This is something that will be sustained over time. WELNA: Still, when asked whether he'd requested additional authority to pursue Russian cyberthreats, Rogers said he had not, first because he's an operational commander, not a policymaker. And second because he was not sure the best response to cyberattacks would be to do the same thing to the adversary. Rogers pointed to economic sanctions and special counsel Robert Mueller's indictment last week of 13 Russians as other ways to hit back. ROGERS: There are tools available to us. And again I think, in fairness, you can't say nothing's been done. But my point would be it hasn't been enough. WELNA: Rogers assured the panel Russia is seeking to undermine America's institutions, but he would not directly criticize the man who could give him more power to fight back. I am not going to tell the president, Rogers said, what he should or should not do. David Welna, NPR News, Washington. Transcript provided by NPR, Copyright NPR.